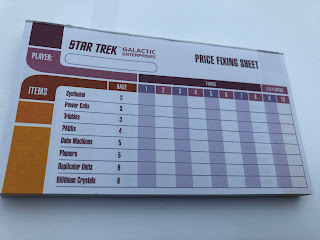 After the joy that Fluxx brought into the Star Trek corner of my world i was skeptical to play Galactic Enterprises - how could this be as much fun to play? 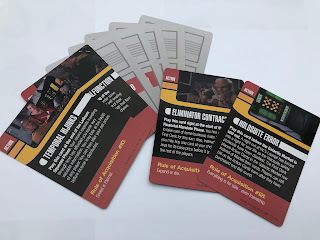 The Star Trek Club of Stoke on Trent stepped forward to help get this one checked over... Coming from Wizkids who are more renowned for Attack Wing, Frontiers, Heroclix et al, Galactic Enterprises is a pen and paper/card game for 2-8 players focusing on the nefarious trading exploits of the Ferengi. Players become the large-lobed wheeler-dealers of the galaxy, bidding for technologies over a series of rounds as well as fixing prices with or without the help of your competitors to become the First Clerk of the Treasury aka the Grand Nagus. The fairly slim initial rule book makes it sound a lot more mind-bending than it is and once you’ve test played a couple of rounds it becomes a lot easier and also a lot more interesting. 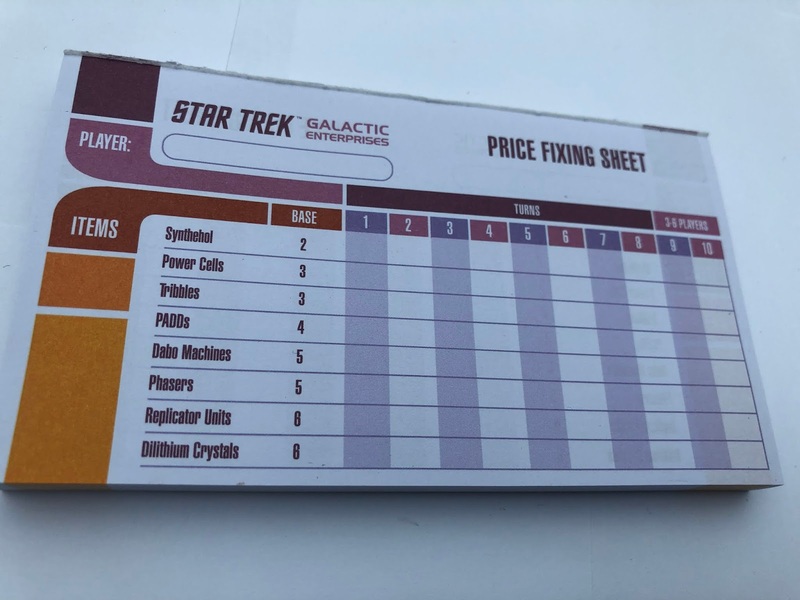 The way that a round works is that the same number of Market Cards (goods) are dealt out onto the table and players then bid for the items available such as PADDs, Replicator Units, Synthehol and even Tribbles. Each player can only acquire one card per bidding round and once that’s been completed you can then fix the prices. Now if a couple of players have the same item you could choose a combined price but all of those with that item need to fix the same price to make a financial gain otherwise the person with the lowest price is the winner - yes, you can undercut your opposition! Being the lowest or second lowest does mean there's some form of latinum payout but if you’re the highest you’re left with empty pockets. We played a full eight player game at last week’s meeting which was the first time id had it out of the box and after those first couple of rounds it became clear that bidding on items that no-one else had early on meant you could max the price as the only vendor and build up a bank against later rounds where everyone may have acquired said technologies. The end result is, of course, to make as much latinum as possible and it's a hell of a lot of fun getting there. As more players start acquiring assets the chances to maximise profits become less and the profits you've made early on become more useful to secure the rights to more items - do you spread your opportunities across multiple things or do you try and monopolise in one area? Seems as straight-forward as you could wish for huh? Totally - until you include the Action Cards. 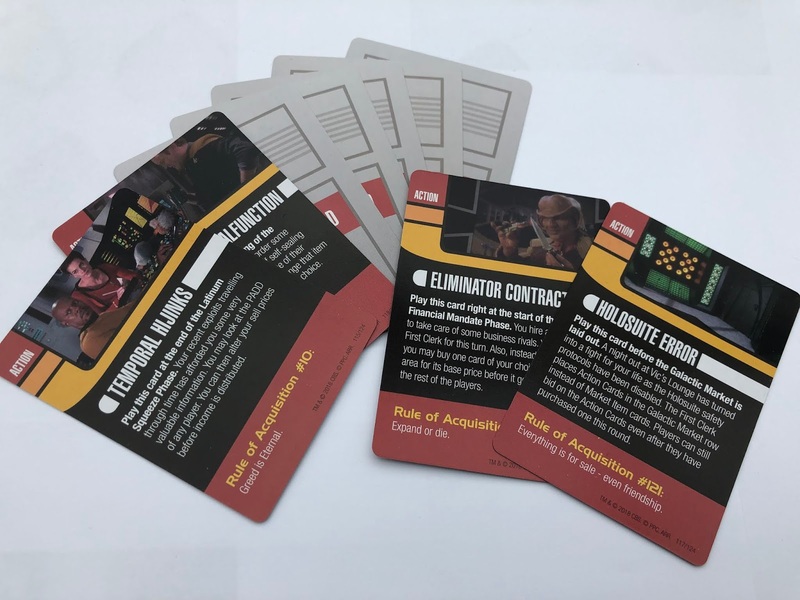 Each round an Action Card is auctioned off for a minimum of one latinum slip. You also get an Action Card once you've won an asset from the table and these can come in real handy. 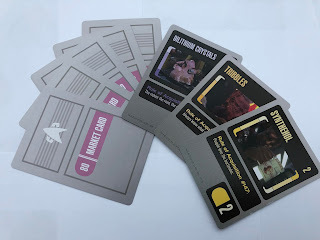 Action Cards can be played in turn while others can be dished out at any time allowing players to steal or swap items from other players or counter other moves being played by opponents. A few of these did get played in the Stoke Club game including a rather confusing mirrored mirror move which meant that one of our more...junior...members ended up winning the game by a clear mile. The rule book does make this game look a lot more complicated than it really is and we had a decent grasp of the rules within ten minutes. Playing with a big group will definitely mean there's less chance of early monopolies on assets but will take a much longer time (obviously) to run through a full eight rounds. Initial reaction was quite muted but once we all understood how it worked the game became a lot more lively. Absolutely one to recommend and I'd be getting this one on your Christmas list right this instant. 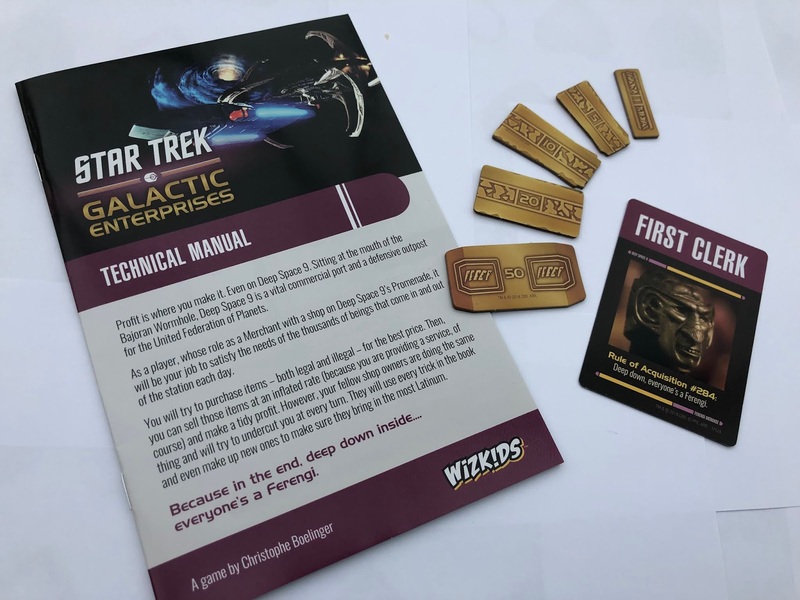 Thanks to Stoke on Trent Star Trek Club for their assistance in reviewing Galactic Enterprises. Have you played Galactic Enterprises? What top tips do you have for success?